When I first saw this Comme Des Garcons top I knew it had to be mine. The stripes! The bows! The peek-a-boo shoulders! I was all in. This piece is all about the details – while it’s a classic style and print, the accented shoulders really bring personality to the piece, don’t you think? Parisian-chic at its best, I’d say. This top looks gorgeous dressed up, but just as pretty with a basic pair of jeans and flats too. Easy pieces like that are essential for travel. I wanted to share a few other pieces I’ll be taking with me to London next week – every item I’m taking has a dual-purpose and will be worn twice. I’m hoping this will help save space in my luggage so that I can bring back a few goodies with me without going over the weight limit. Keep in mind it’s going to be cold there, so I’m taking a separate smaller bag (just bought this chic duffle!) to check just for my coats since they are heavy and take up so much space! Love this top, it is perfect! Have fun in London and Paris. 1. Your shoes are the coolest heels I’ve ever seen. 2. You look so French! The heels on those shoes are killer! Love all the details in this outfit that make it standout. And leather, I love everything leather this season. I will be purchasing this shirt. Amazing! 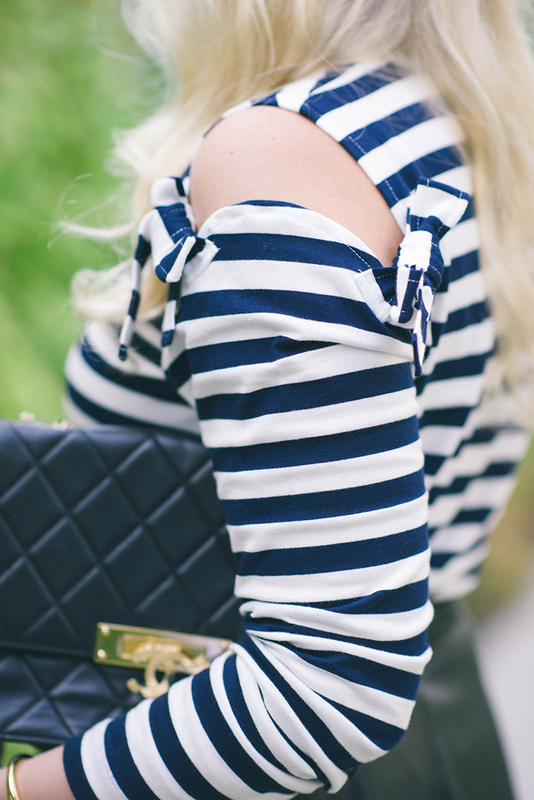 All is my favorite details in one top! So jealous London is so soon!! 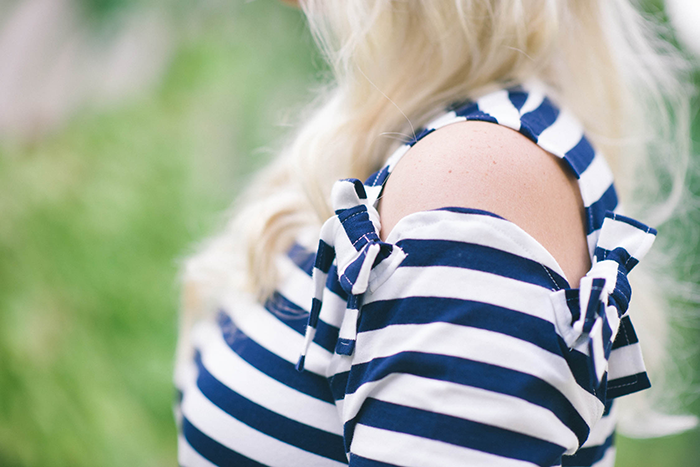 The shoulder detail on that top is divine. Have a great trip! I love the unique cutouts of this shirt! So fun! 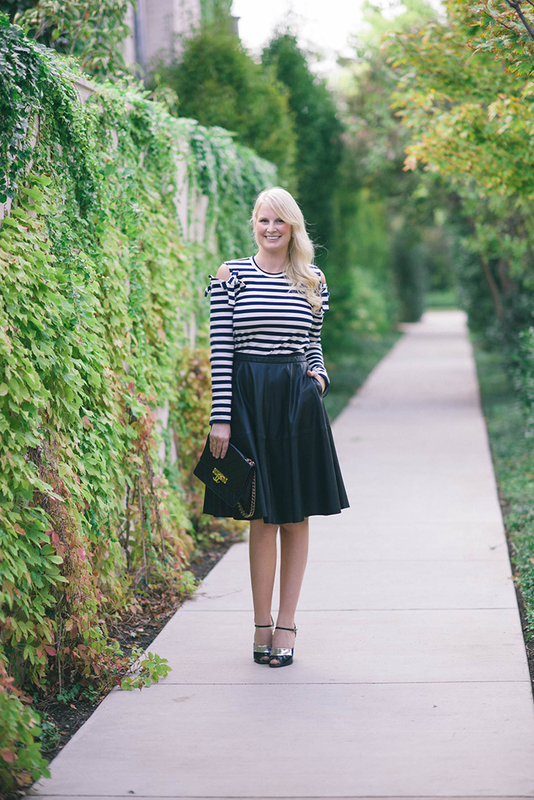 Loving this look– so French chic and feminine! That skirt is so fun and I love how you accessorized with gold. You look so pretty! Love this look! That top is adorable! Ah that top is so cute! Have a wonderful weekend, lady! This darling top!! 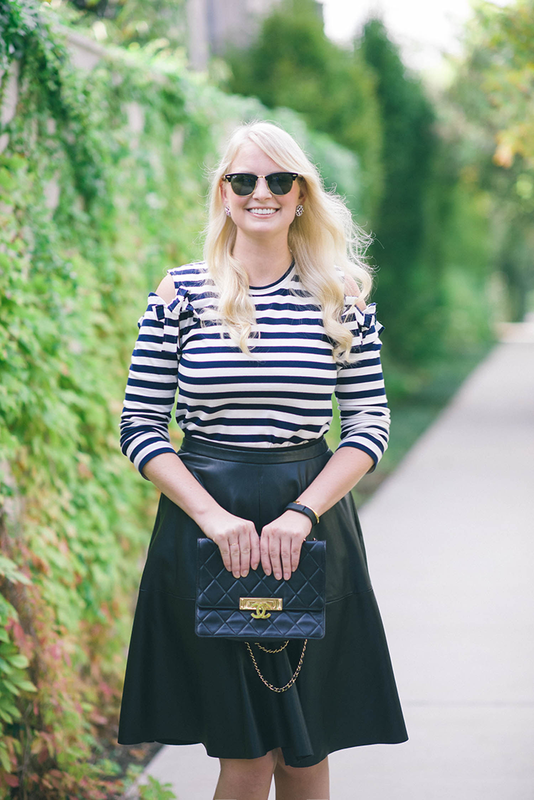 Like you said, the stripes the bows and peekaboo make it a must have staple. That striped top is so so good!!! SO very you!! Have a great trip! Looking forward to following along! Cute top. Also, enjoy your trip next week. I cannot get enough of the bows on your Comme Des Garcons top! I love the feminine touch! Those shoes are divine!! This whole look is perfect! I love stripes right now! Pingback: Glam Round-Up #9Glam Slam! | Glam Slam!